Quiet, a great beach, a nice pier and good restaurants. Cayucos is a great beach town for kicking back and relaxing. Cayucos-by-the-Sea - if you are looking for a party beach town with lots of night life and a constant swirl of activity - this beach town is not it. "...one of the coolest small towns in America". I agree with that and Cayucos-by-the-sea is one of our favorite beach towns on the central coast. The town sits on Estero Bay and is 6 miles north of Morro Bay and 13 miles south of Cambria along Highway 1. Translation of the name "Cayucos": from the Native American name for "canoe" or "kayak". 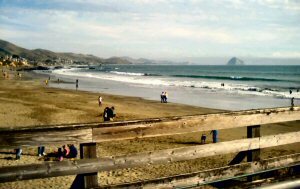 As you can see from the photo to the right, Cayucos has a broad, sandy beach that's great for all sorts of beach activities. 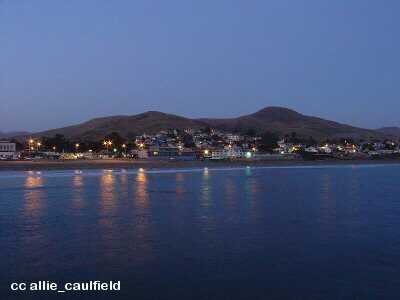 Cayucos has a sort of "cowboy" feel to it and it is often referred to as a "cowboy beach town". That comes from its history with cattle ranching having been a major industry in the nineteenth century in the hills behind the town. And that's just another way of saying that Cayucos-by-the-Sea is "cool" and a "relaxed and laid-back" town. Cayucos as a "base of operations"
If your life outside of vacation time is hectic and harried - a stay here might be just the thing - taking walks on the beach, a stroll down to the end of the pier, a nap, dinner and a sunset. If that's way too relaxed for you, you can drive just a few miles up the road to Estero Bluffs State Park or Harmony Headlands State Park for a bit of hiking along some beautiful and pristine stretches of beach. If you're adventurous, you are only 9 miles south of the tiny berg of Harmony, where there is wine tasting and glass blowing and pottery. Cambria is only another 5 miles past Harmony where there is great shopping, art galleries and more fine restaurants. Or, from your beach hotel, you are only 20+ miles from the Paso Robles west-side wineries, which is an easy drive on Highway 46. Even if you want to be a "beach-slug", don't miss this drive! It is one of the most beautiful in all of Central California. 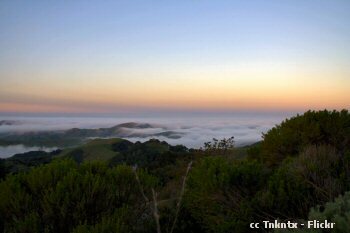 There are several turn-outs which afford spectacular views of the coast from Montana de Oro to Point Piedras Blancas. If the coast isn't fogged in (it sometimes happens even in summer) or even if it is, drive up there (only about 15 miles from Cayucos) about an hour before sunset and stake your spot to watch the sunset. You'll be somewhere between 1200 and 1500 feet above sea level and you won't believe the show you'll see. 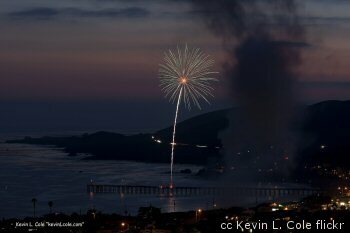 A highlight of events in Cayucos-by-the-Sea - see this page for a full listing and details on the events below. Second weekend - Cayucos Sea Glass Festival - see this Photo of the Week archive page for our report on the 2012 event. Independence Day - sandcastle building, BBQ, parade and fireworks off the pier. It's a really good show. A wonderful place to stay and eat. The restaurant buys most of its ingredients from local producers - dairy, meat and produce. This gives you a wonderfully unique experience that allows you to have a truly "local" meal. Like no place I've seen, Ruddell's smokes and serves up tasty fish, meat and poultry with flavors from wood that is specially paired with the meat. 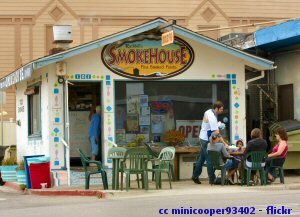 Tacos, sandwiches and smoked items by the pound - be sure to stop here for a Cayucos treat. Breakfast, lunch and dinner - the Sea Shanty is a local favorite. Seafood and just plain good food is what the Sea Shanty specializes in.